Sen. Martha McSally of Arizona lost her 2018 election bid but joined the Senate by appointment this year. Despite losing a Senate election last November, Republican Martha McSally still became a U.S. senator. She was appointed to fill the seat held by the late Sen. John McCain,1 but to hold on to the seat, she will have to win a special election in 2020. Assuming she runs and wins her party’s nomination, McSally would be the 12th major-party candidate since 1984 to contest a Senate general election just two years after losing one.2 It’s a small sample, but the bad news for McSally is that although almost all of those second-chance candidates improved upon their previous performance, only four of them won on the second try. *Gorton was an incumbent running for re-election 1986. List only includes Senate general elections that took place on regularly scheduled federal November election dates. In 2012, Republican Scott Brown ran for re-election and lost in Massachusetts; in 2014, he unsuccessfully sought a seat in New Hampshire. To be clear, we shouldn’t project too much about McSally’s chances from this data set, since this is a small sample — 12 elections across almost 35 years — and several of these candidates ran under unusual circumstances. For instance, Slade Gorton was a sitting senator running for a second term in 1986 when he lost his re-election bid; two years later, he came back and won the race for the other Senate seat in his state. Then there’s the very peculiar case of Scott Brown, who lost his 2012 re-election bid to Democrat Elizabeth Warren in Massachusetts and then ran in a different state two years later. He did a bit better the second time but still came up 3 points short.3 And Delaware’s Christine O’Donnell was something of a fringe candidate running at the height of the tea party movement. Although she did better in 2010 than in 2008, she still lost by almost 17 points the second time around, and she may have cost Republicans a pickup opportunity in a GOP wave year. And even though most of these repeat candidates never made it to the Senate, for a few of them, the initial defeat was not a kiss of death, especially if the race was relatively close the first time they ran. The three who lost by the narrowest margins the first time around — Gorton, John Ensign and John Thune — all went on to win two years later. This might augur well for McSally, who lost by a little over 2 points in 2018. But there is some evidence that changes in the electoral environment and the type of opponent a candidate faced can spur a successful turnaround — or at least this appears to be true in three of the four cases where the repeat candidate won on the second attempt. Ohio’s Mike DeWine, for example, first ran unsuccessfully in 1992 against three-term Democratic Sen. John Glenn, who had always won more than 60 percent of the vote in past elections but garnered only 51 percent against DeWine. However, when DeWine ran again two years later, he easily won an open seat as part of the 1994 Republican wave. As for John Ensign of Nevada, he lost by just 428 votes to Democratic Sen. Harry Reid in 1998, which was an unusually good midterm for Democrats, who held the White House and so would be expected to lose seats in Congress under most circumstances. But two years later, Ensign had no trouble winning an open-seat race in 2000 while George W. Bush carried Nevada for the GOP at the presidential level. Like Ensign, John Thune of South Dakota lost by fewer than 600 votes in 2002 to incumbent Democratic Sen. Tim Johnson. But Thune then defeated Senate Minority Leader Tom Daschle by 1 point in 2004 while Bush carried South Dakota by 21 points. As for Slade Gorton of Washington, he successfully mounted a Senate comeback attempt after losing as an incumbent in 1986. He narrowly won by 2 points during a presidential cycle in which Democrat Michael Dukakis carried Washington state by less than 2 points. As for McSally, she’ll hope to benefit from Arizona’s Republican lean and a lift from the presidential coattails, but considering President Trump only won the state by 3.5 points in 2016, McSally may not be able to count on a baseline GOP edge in 2020. What’s more, of the repeat candidates we looked at, only McSally was appointed to a Senate seat following a defeat. So she’ll be running as an incumbent of sorts in 2020, but that’s not necessarily to her advantage. Appointed incumbents have a mediocre re-election record compared to their elected counterparts: Prior to the 2018 election, 53 percent of appointed senators who ran for another term had won re-election, compared to 78 percent of elected senators. McSally’s appointment may not promise much for her future electoral success, but appointments are an important method of getting women into the GOP caucus — and the Senate in general. Includes senators such as Lisa Murkowski and Kirsten Gillibrand who have since won elected terms. In the 116th Senate, 11 out of 100 members first joined the Senate as appointees, although many of them were appointed years ago and are now serving elected terms. Five of those 11 — three Republicans and two Democrats — are women. Although both parties have about equal numbers of women in the current Senate who were initially appointed, those appointees account for 38 percent of all GOP women in the Senate compared to just 12 percent of Democratic women. This reflects the makeup of the two parties — women are more likely to be Democrats than Republicans — but also how each party’s electorate responds to women on the ballot. According to the center, in the 2018 cycle, 48 percent of women who ran for Senate as Democrats won their party’s nomination, while 36 percent of GOP women candidates won.4 In the House, 51 percent of Democratic women and 43 percent of Republican women won party nominations. In Senate races, about 40 percent more women sought office as Democrats than as Republicans, and in House contests, about three times more Democratic women than Republican women entered the race. The gap between Republican and Democratic women — where fewer women seek a GOP nomination, as the chart below shows, and those who do are less likely to win it — contributes to a growing partisan gap in female representation in Congress. So appointments like McSally’s are an important part of increasing the number of women in the Senate as a whole, but especially the number of Republican women. Overall, 20 percent of women and 8 percent of men in the current Senate were appointed to their first terms, but close to half of all GOP women senators started out as appointees. Historically, appointments have provided the initial entrance for nearly one-third of women senators dating back to the first woman senator, Rebecca Felton of Georgia, who was appointed in 1922. 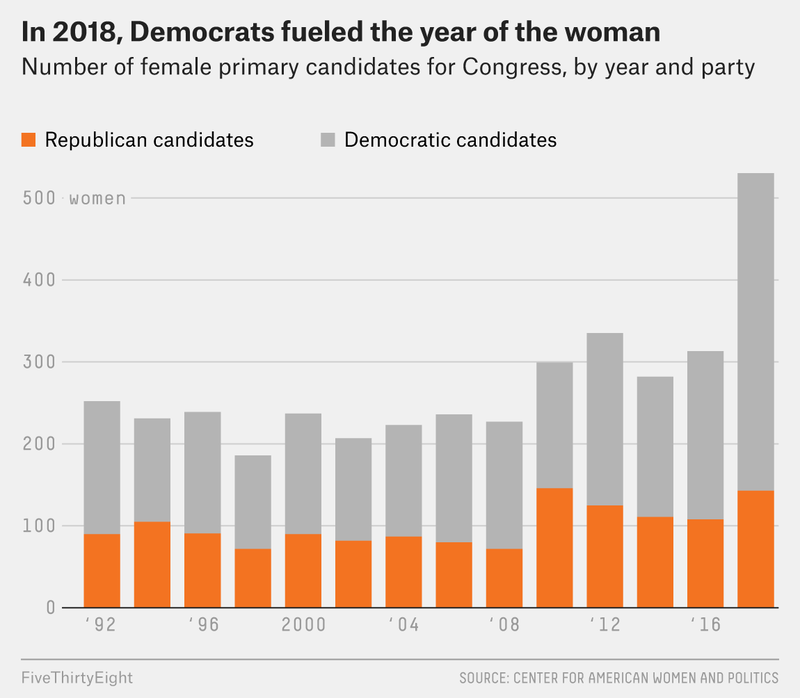 The Democratic Party has sent more women to Congress in recent years, but Republicans are sending fewer women to Congress this year, even though McSally’s appointment helped bring the total number of women serving in the Senate to a record high of 25. Five of the eight Republican women in the Senate are up for re-election in 2020,5 so McSally’s re-election success — or failure — will be play a major role in determining not only the overall success rate of repeat Senate candidates but also the relative diversity of the GOP caucus. Arizona Gov. Doug Ducey first appointed Republican Sen. Jon Kyl, but Kyl resigned on Dec. 31, 2018. This includes only elections that occurred on regularly scheduled November election dates. It also excludes minor Democratic and Republican candidates from Louisiana who did not finish first among their party’s candidates in the state’s jungle primary or who failed to advance to a runoff if there was one. Brown first entered the Senate by winning a January 2010 special election, so he ran for Senate three times in the span of about five years. Counting Mississippi Sen. Cindy Hyde-Smith, who was the top Republican in an all-party primary held on Election Day. Along with Hyde-Smith and McSally, Shelley Moore Capito of West Virginia, Susan Collins of Maine and Joni Ernst of Iowa also hold seats that will be contested in 2020.